China's Ministry of Commerce is pursuing legal remedy against the U.S. over new tariffs on $200 billion worth of Chinese imports. 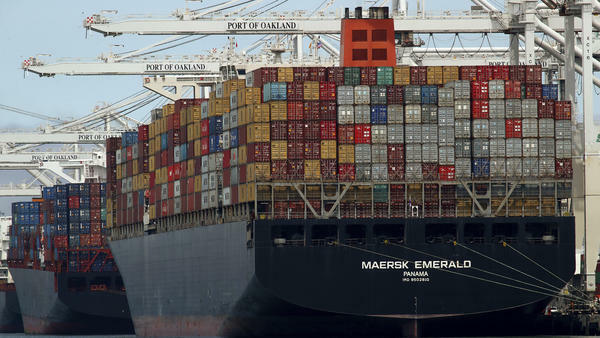 Here, a container ship is unloaded at the Port of Oakland in California last week after completing a voyage from China. The WTO complaint comes less than a week after the Trump administration published a preliminary list of more than 6,000 Chinese products that it wants to hit with an additional 10 percent duty. The list targets products worth a total of $200 billion, ranging from an expansive range of seafood and vegetables to stones, metals and plywood. The latest U.S. tariffs were announced days after China retaliated for an earlier round of U.S. import taxes of up to 25 percent on items worth about $50 billion. The deteriorating trade conditions with China have rattled a variety of economic sectors, affecting prices of raw materials such as paper. And separate U.S. tariffs on aluminum and steel, which hit Canada, Mexico and the European Union, have also led to higher prices on some products, as NPR reported earlier this month. Citing its investigation that began in August 2017, the Trade Representative's tariff notice said it concluded that China's actions and policies "are unreasonable or discriminatory and burden or restrict U.S. commerce." China disputes the U.S. allegation, saying last week, "The tariffs are typical unilateralism, protectionism and trade bullying. They are a clear violation of the basic WTO principle of most-favored-nation treatment as well as the basic spirit and principles of international law." As for the reasons behind a trade imbalance between the two countries, China blamed Americans' low savings rate and other broad economic issues. China added that it doesn't want a trade war — but that it is not afraid of having one. Last year, the United States' total trade in goods with China topped $635 billion, according to the U.S. Census Bureau. In that year, the U.S. says its goods trade deficit with China was $375.2 billion.